The beauty of a purebred dog is that you know what to expect in terms of basic temperament traits and looks. For example, you know that the average Pembroke Welsh Corgi is going to love to try and herd just about everything that moves and that the Cairn Terrier is going to let you know if any mice are spotted about the property and swiftly take care of the problem. These are breed specific temperament traits based on the reason these purebred dogs were originally bred. 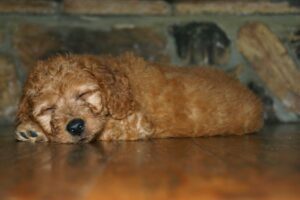 The Doodle is a still developing dog that is comprised of two purebreds, but it is not a full purebred dog yet. The breed is still too young for it to be considered purebred and true to type. So, how do you know what a Doodle personality will be like? Depending on what the mix of the Doodle is, it is most commonly comprised of a Retriever and a Poodle. Each of these breed types brings something different to the table. 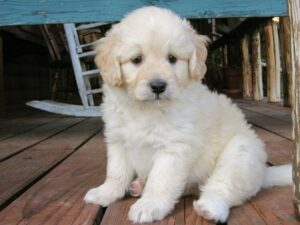 Retrievers, both Labrador and Golden, are considered to be intelligent, people-pleasing dogs. They have a high desire to be with their handler and to work with their handler. They love everyone and have a very social, outgoing nature. They are also incredibly tolerant of people and other dogs. These are a few of the traits that make them highly sought after as service dogs. Retrievers are capable of following commands many, many times and repetitively doing well just because you asked them to. Poodles are also very intelligent, and often considered to be one of the most intelligent dog breeds. Whether they are more intelligent than Retrievers is debatable (depending on how you define dog intelligence), but one trait that is more prominent in the Poodle is the problem solving skill. They are less likely to be fond of heavy, repetitive training. Instead, they are good at figuring out how to solve a problem without necessarily being told. They have an observant nature about them. Poodles enjoy people too, but they aren’t always as outgoing with every new person as the Retriever personality. When the Doodle combines the Retriever with the Poodle, you get a fairly even blend of the personalities. You get a smart, pleasing dog that loves to be with you, but one that is fully capable of solving a problem. Basically, you get a smarter, easier to train dog that loves to be with you! Something else that happens when a Poodle crosses with a Retriever, you miss out on some of the “bad” habits of Retrievers. Retrievers have an excitable love of life, which can be endearing, but at the same time can be overwhelming. Especially in their youth, a Retriever can’t wait to say hello and often is the first to rush to you (and over you) to greet you. Their social excitement is what often causes a lack of manners as they exuberantly greet every new dog and person with a very physical hello. This physical side of the breed can easily knock small children or unsuspecting adults to the ground! Retrievers think nothing of invading personal space, and in fact, it’s almost a requirement to do so. A Poodle, on the other hand, tends to be more polite and mannered. They notice where you are! They are softer natured and don’t always stand up to accidental rough handling well, but when the Poodle is crossed with a Retriever, one finds that the Doodle blend creates a dog that is outgoing and social, yet more cognizant of personal space. They are just more mannered. Additionally, the Doodle handles a child that might accidentally yank a chunk of hair quite well; whereas, a Poodle may totally not appreciate this! Generally speaking, the Doodle temperament blend is unique, and you’ll find the best traits of both Retrievers and Poodles. Ideally, the Doodle is a smart, easily trained dog with good social graces, and for many families, it can make for the ideal canine companion. 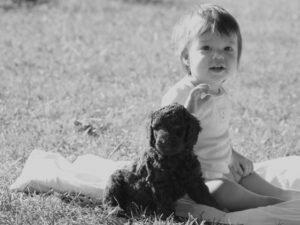 When discussing with a breeder what kind of Doodle dog you’d most like for your family, make sure that the personality and temperament of their individual dogs matches up with what you need. Within every breed profile, there are individual dogs. The ideal temperament and personality that is defined for that breed doesn’t always fit every individual dog. There are always dogs that vary from the ideal. It is possible to have a hyperactive, aloof, pushy, etc. Retriever, Poodle, or Doodle even. You want to seek out the most balanced, even tempered parents possible, as these dogs will create the most balanced, even tempered puppies. A quality breeder will accurately represent the temperament of the pedigree line to you. Also, if possible, visit with some adults, including the parents, at a breeder’s facility. If you don’t like what you see in the adults, you won’t like what you see in the puppies as they mature as puppies will take after the genetic line.